Earlier this year, I was invited to join an unusual project of retelling animal stories from the Korup region of Cameroon that might otherwise be lost. The project was started by author Tom Moorhouse who is also a wildlife conservationist. 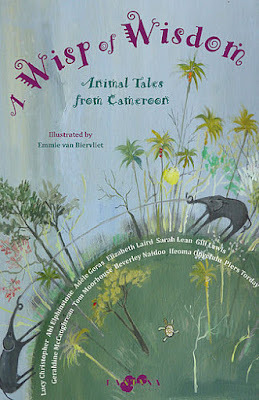 Tom and all the authors who have worked on A Wisp of Wisdom, as well as the artist Emmie van Biervliet, have given their time free of charge. This is so that 2000 copies of the book can be sent to children in the Korup region. In this part of Cameroon most children speak English as a second (maybe even third) language - and books are scarce. We think you will find the stories are full of fun as well as wisdom. There are tricky tortoises, cunning monkeys, blue-bottomed drills, flies stronger than elephants, hungry crocodiles and animals who gather for meetings in the sky. You can find out more about the project, the storytellers (I think you will know some of them!) and how you can buy the book here .